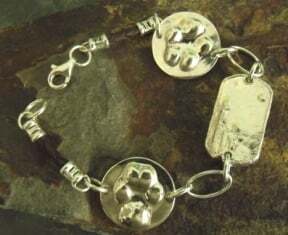 For those who would like an alternative to wearing a necklace, the pawprint bracelet is the perfect option. There are a myriad of custom options or combinations for the bracelet. Personalized inscriptions are hand written on the back of your custom pendant(s). Pictured: Two small circle relief paw pendants and a human dog tag replica with braided brown leather cord.